“Ellen had the most fantastic time with you in August and for me it seemed like she was all ‘grown up’ when we collected her on the Friday. I’m sure she had a real confidence knock whilst she was ill and on treatment and reverted back a couple of years into a shy unassuming girl. I think having cancer and being different amongst her peers and friends and family has put her in the spotlight, something she would have hated two years ago. “Thank you so much for giving Hannah and Katie such a fabulous time at Tracy Ann House. They have come back with so many wonderful stories about their week, that I don’t know how you managed to fit it all in! Hannah surprised herself immensely when she was with you and was delighted that she managed to take part in so many activities. “I am writing to commend the excellent work done by yourself, Brenda Clark and all the staff at The Youth Cancer Trust, for young people suffering with cancer. I work with children and young people who are suffering with bone cancer for which treatment comprises of 6-12 months of chemotherapy and major surgery. The side effects of this treatment are exceptionally debilitating and invariably render the recipient dependent on others for their care. Many of these young people are understandably frustrated by their loss of independence and become depressed, losing interest in every day life and their future. It is therefore, of great importance that they are given goals, objectives and something to look forward to at the end of their treatment and holidays are very frequently requested by their families. 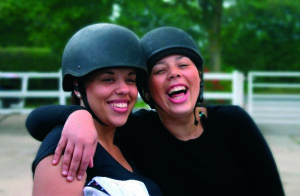 The activities arranged at Tracy Ann House provide these young people with ‘breathing space’ away from everything associated with their treatment and give them the opportunity to re-assert their independence and some control over their lives. Patients from this hospital who have sampled the delights at Tracy Ann House have returned refreshed, excited and perhaps most importantly, with renewed optimism for life and their future. There is undoubtedly a great need for establishments such as Tracy Ann House and the enthusiasm, efficiency and hard work undertaken by all the staff involved in the organisation of the holiday, make it the success it is today. “I just thought I would drop you a note before our next group of teenagers arrive on Monday. They are all really excited and looking forward to their holiday with YCT. Our previous group had a fabulous time and are all hoping they can return sometime in the future.